We have broadcasting and yearbook, but this room is only for yearbook. 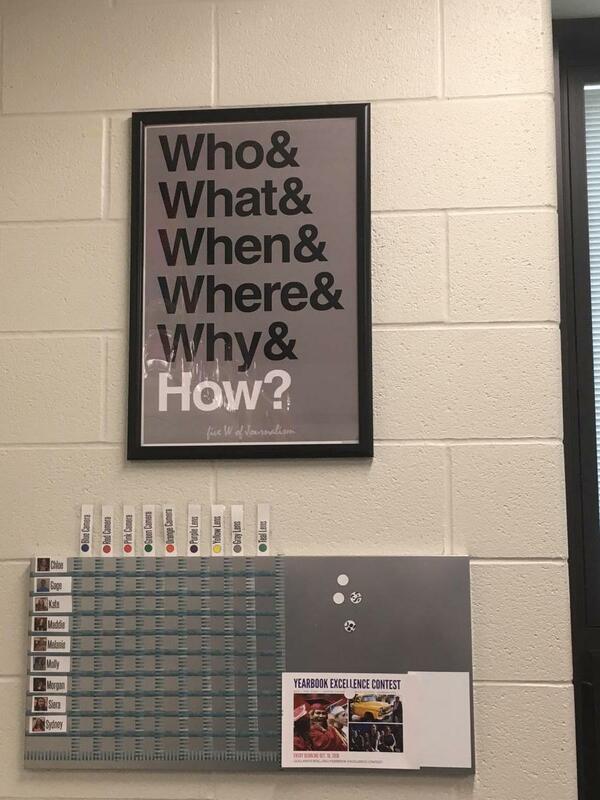 I teach six sections of English a day, so we share the space with my English classes. 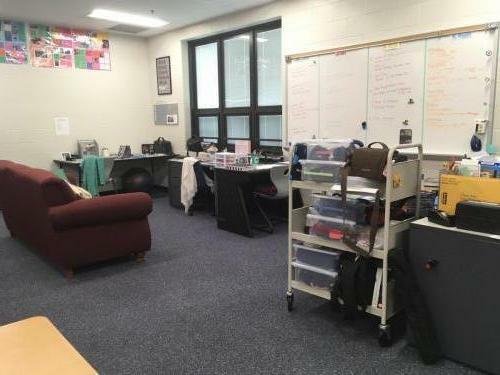 Originally, the yearbook students just sat in regular student desks, but over the years we’ve carved out our own space. My editor has a full teacher’s desk and my other kids in leadership positions have other desks or tables for their work areas. Several kids have brought decorations, photos, etc for their their desks. Last year, we added a couch. We even have camera pillows. We are a one-to-one school, so all the kids use laptops. They are definitely close and cozy. It’s small, but I think the staff likes how personal it allows them to be. The entire staff eats lunch in my every day. 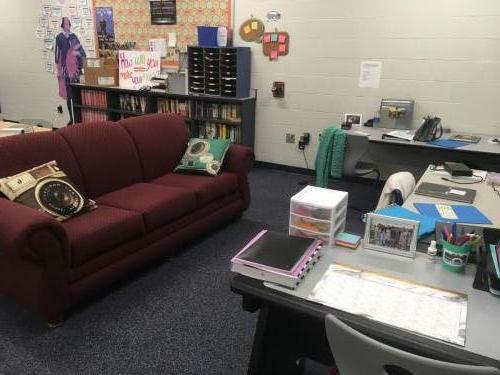 The couch divides the room from the English desks, so when students come in to work during other periods, it still feels like a separate space. 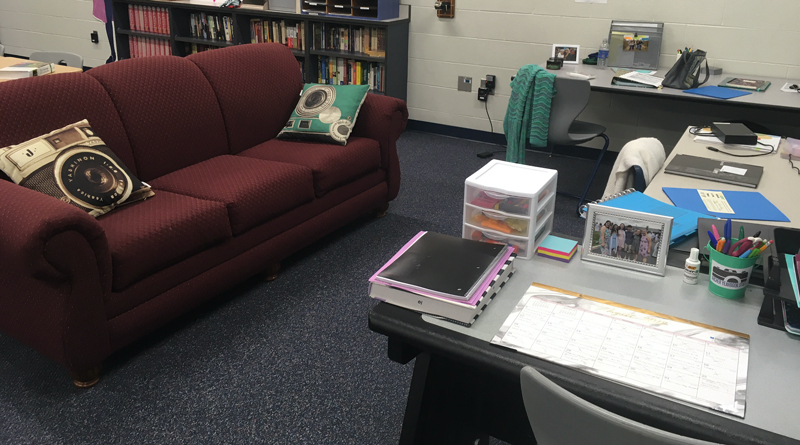 The teacher desk gives a professional feel for my editor, but the couch keeps it personal and fun. They treat it like their home. 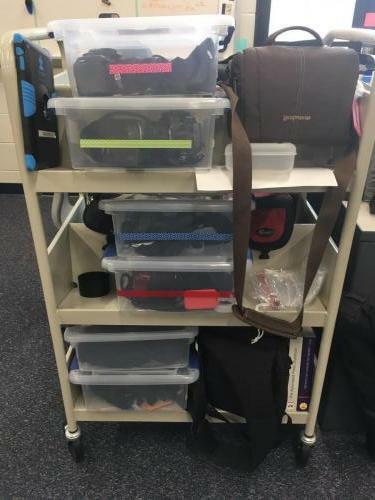 The have so many personal belongings in my room including blankets, extra clothes, snacks, along with books and homework from other classes. All students have their own laptops. We use Adobe InDesign and Photoshop. We use AssetTiger to sign out cameras if they are leaving the building, Trello for assigning spreads and ads, and Slack for productivity and staff communication. We own five Nikon cameras. Three staff members have their own Nikons. We just invested in some better lenses. We just bought a Nikon 24-70 mm lens. It has made such a difference in our photography. It was a big investment for our little staff, but we’re already making plans to purchase a second one. 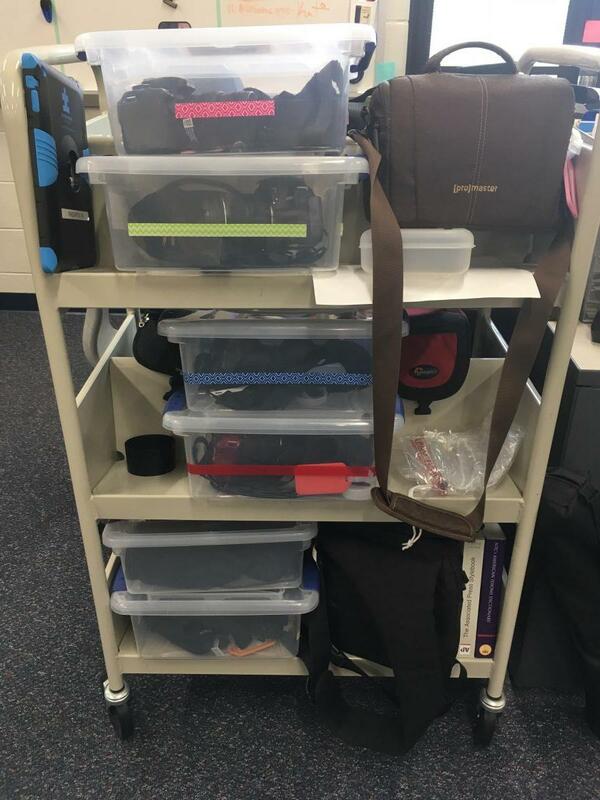 Our school supplies our laptops. The furniture other than the student desks has been salvaged from other areas of the building. 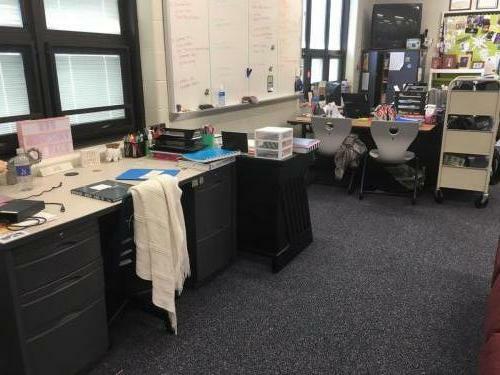 Most of the decor is from me or the students. All of our cameras and other equipment are paid for out of our yearbook account. We would really like to have some softboxes for portraits. We applied for a grant last year but didn’t get it. Our eventually goal is to take all of the portraits for the yearbook because the school’s contracted portrait photographer is pretty terrible. We need the lights to be able to do them.